I made my own Holiday Lights Tam after my mom's was such a success. I’ve had a sock project on my needles for awhile, but something strange happened in the past month that really threw a wrench in the works: It snowed. A lot. I’ve lived in Montana for a long time. Long enough that snow in January shouldn’t take me by surprise, but that’s exactly what happened this year. So, while I desperately wanted to work on my bamboo lace socks in preparation of spring, my sad little ears kept asking for hats. And really, who am I to say no to cold ears? Over the past month four hats have come off my needles, and one didn’t even stay with me. (My mom loves her Garden Party Lights Tam, by the way). Just in the past two weeks I supplemented by beautiful Rose Red cabled slouchy hat with my very own Holiday Lights Tam (which I call my Scarlet Beaded Tam) and a simple blue-green beret using yarn leftover from my dad’s Christmas Cobblestone sweater. 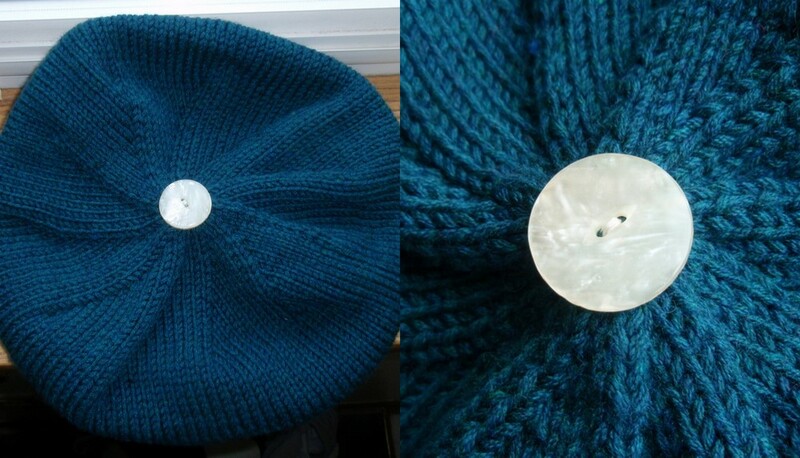 My Farmer's Market Beret features a charming vintage button detail. 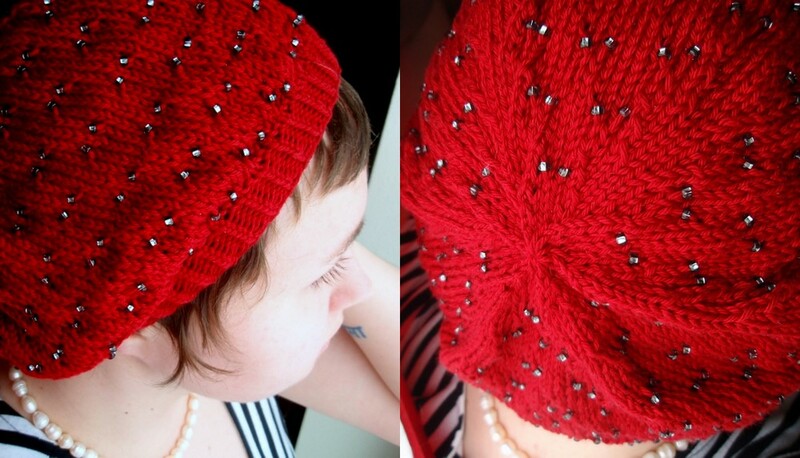 My Farmer’s Market Beret is made using Hannah Fettig’s Early Morning Beret pattern and features a vintage button from a collection my mom gave me more than a year ago. As a full-sized beret this hat is much slouchier than my tam or my Rose Red hat, but by this summer my hair will have grown out even more and I think this hat will look great and keep my ears warm when I hit the early morning farmer’s market by the river. Since I finished my Scarlet Beaded Tam yesterday I haven’t looked at a single hat pattern on Ravelry, but I have completed a lace repeat on my socks. I think it’s safe to say that my ears are satisfied, which is good because it started to warm up a bit this week I feel confident that spring will in fact arrive soon. I’d better have some charming lace socks ready to go when it gets here. My Scent of Lavender Socks. I am working down the leg of the second sock at the moment, so hopefully I’ll have a completed pair by the end of next weekend. 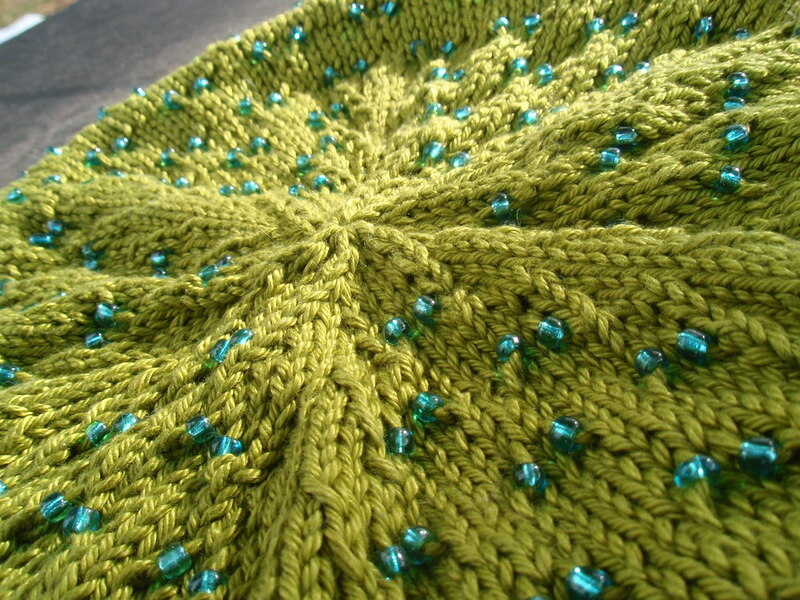 I love the pattern and I love this yarn (courtesy of my brother-in-law). Can’t wait to wear these with some cute shoes! Yarn: Cascade Ultra Pima, 220 yards, 100% pima cotton, colorway: 3713, purchased at Loopy Knit/Crochet in Missoula, Mont. Sorry for the short post, but as you can see, I’ve been busy knitting.